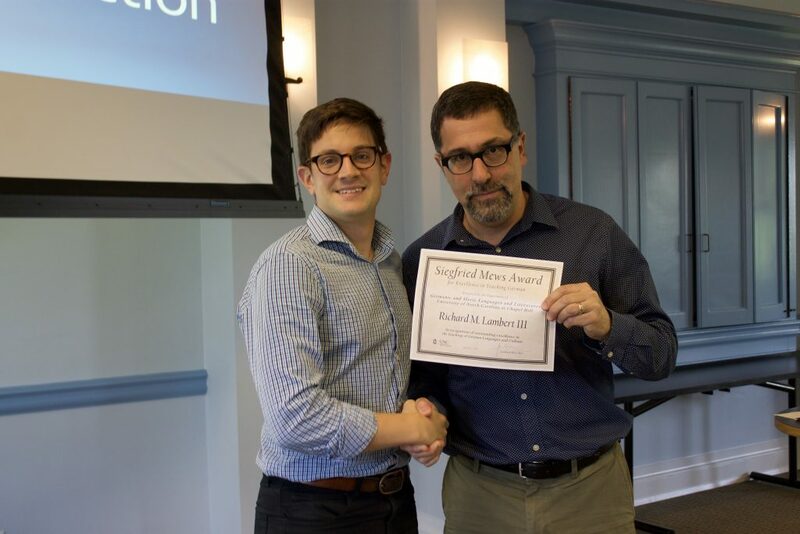 The recipient of the 2016/17 Siegfried Mews Award for Excellence in Teaching German is Richard M. Lambert III – better known as Tres to the vast scores of undergraduate students who he taught over the years at Carolina. Tres joined the Carolina-Duke Graduate Program in German Studies in 2010 and is currently working on his dissertation on the concept of experience in late Austrian modernism. For the academic year 2017/18, he has been awarded a dissertation completion fellowship by the Graduate School at UNC. We congratulate Tres Lambert on receiving this departmental teaching award.